Sanborn Central/Woonsocket is making history this fall sports season, fielding their first ever cross country team. While individual runners from Woonsocket School have competed in years past, this is the very first year cross country has been offered at Sanborn Central. Together, the schools have enough runners to make up a team. It takes at least four boys and four girls to be considered a team, although individual runners can compete at meets. It’s been a successful start so far for the team, with a good showing at their first meet, the Mitchell Invite. Five girls and six boys are signed up to run for the Blackhawks this fall. Sept. 3: CBH – Plankinton, 10 a.m.
Sept. 7: 281 – Wessington Springs, 10 a.m.
Sept. 13: Arlington, 4 p.m.
Sept. 21: Dell Rapids, 3:30 p.m.
Sept. 28: Colman/Egan, 1 p.m.
Oct. 3: Howard, 3 p.m.
Oct. 12: Regions at Gettysburg, 1 p.m.
Oct. 22: State, 2 p.m. 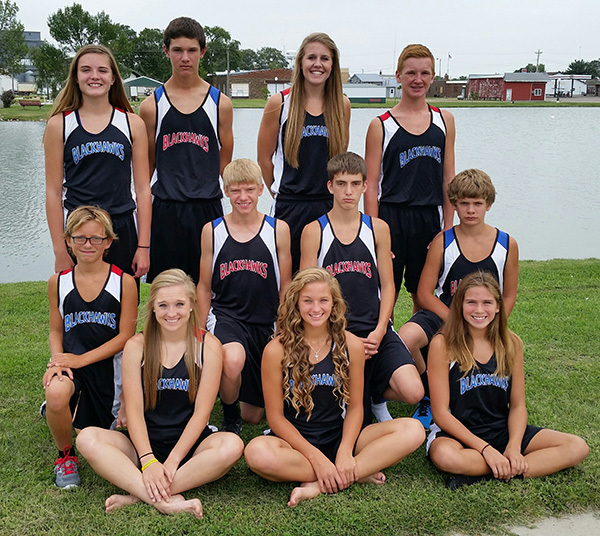 THE FIRST SCW Cross Country team is pictured above, bottom, right to left: Kayla Olson, Sydney Zeller, Trinity Boschee; middle: Braxton Gentles, Austin Schmit, Malachi Bruce, Brayden Eagle; back: Megan Poyer, Tater Moody, Myah Selland, Spens Schlicht. Not pictured: Coach Shelley Schlicht.